It’s time to get ready for the fall and winter. Do you need any pillows or curtains cleaned? Do you have winter and fall items stored and when you took them out you felt they needed to be cleaned for the season? You’re in luck! 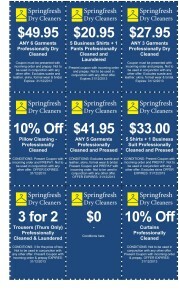 You can use this SPRINGFRESH DRY CLEANERS DISCOUNT COUPON for a multitude of things! You can’t beat this discount, and it’s not going to last for very long so you need to get on over there and take your items before time runs out. Dry cleaning can get very expensive, especially if you have a number of items that need to be addressed. Don’t delay – they are waiting for you. $49.95 for any 6 garments to be professionally dry cleaned. $20.95 for 5 business shirts and a pair of pants, $27.95 for any 3 garments, 10% off pillow cleaning, $41.95 for any 5 garments, $33.00 for 5 shirts and 1 business suit, Thursday only 3 for 2 pants special and 10% curtains. With all those discounts, you need to head on over there and get your items cleaned quick, fast and in a hurry. If you’re a business person that has to wear corporate attire, this is a boon! If you dress professionally for church or other functions on a regular basis, then these coupons will come in handy for more than one occasion. It gets hard sometimes when you know you need to have your items cleaned and you can’t because the expense is so great. Springfresh has given that some thought and decided to pass some savings along so that you can get what you need when you need it. That’s great customer service. Grab your things and get on down to Springfresh before you miss the sale! And at these discounts, you can’t afford to miss it!